A fairground has been fined £15,000 over a mini train crash which injured three people, including a boy of two. 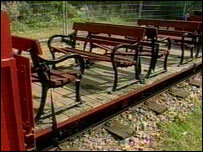 The open-air carriage at Wicksteed Park in Kettering, Northamptonshire, derailed on 7 September last year. The train, which has a top speed of 12mph, came off the tracks and snapped wooden slats used for seating, throwing passengers to the floor. The company has apologised to those injured for any distress caused, and said it has an excellent safety record. The park's owners pleaded guilty to breaching health and safety laws at a hearing in May. A man of 35, his two-year-old nephew and a woman in her 20s were treated in hospital for back injuries and bruising. Magistrates fined the management company after hearing that sections of track were damaged and that previous operators had ignored warnings about the state of the track from the Health and Safety Executive. David Morgan, representing the charitable trust which owns Wicksteed, said the company had appointed new companies to oversee engineering standards on the railway, and had brought in a new training system for staff. John Roberts, the managing director of Wicksteed, said "Obviously, we apologise to those who were on the train and injured. "Nobody really knows exactly why this happened, but we have taken no chances and we have invested £250,000 in the railway." Michael Affonso, 35, whose nephew Joshua Handford was hurt when their carriage derailed, said he was disappointed with the level of the fine, because the two-year-old was traumatised by the incident. He said: "He is quite upset, and now if you ask him if he wants to go on a train he just says 'choo choo go away'."